Terms and Definitions are designed to assist in understanding the “language” of the company. Each definition is based on the expertise and understanding of the management. Document stating results achieved or providing evidence of activities performed. NOTE 1 Records can be used, for example, to document traceability and to provide evidence of verification, preventive action and corrective action. NOTE 2 Generally records need not be under revision control. Manages / coordinates work of: her/his own work. Project administrators develop policies and procedures. They oversee activities of project managers and they collaborate with superiors to develop plans and evaluate progress. Project administrators perform a more strategic role by establishing procedures, motivating subordinates, implementing process improvement projects and building relationships with stakeholders and sponsors. Project administrators also check for errors and manage risk so projects achieve their expected outcomes. Control of other inputs and if deemed needed and/or necessary updating of info at the websites. In special cases when the representation of the whole group is needed, the representation will be provided as per table above. Manages / coordinates work of: All EMPs in the respective OU. a.The CEO runs the Grouping on a daily basis. He organizes and supervises the staffing and the operation of the “Secretariat”. The Secretariat's staffing, the duration of their appointment and the terms and conditions of their remuneration shall be approved by the “Executive Board. b.The CEO performs her/his duties in agreement with the Executive Board and regularly reports to the Board and habitually to the President. Contracts between the Grouping and the European Commission or any regional, national or international body, public or private. c.The particular duty of the “non-executive General Manager(s)” is to challenge the decisions of the CEO, and provide the second opinion when appropriate and/or requested by the Executive Board. d.The Managers shall take acts and commitments on behalf of the Grouping only if such acts and commitments remain within the annual budget of the Grouping. e.The work of the Managers may be remunerated in agreement with the Executive Board. f.The CEO has the possibility of delegation according to Art. IV.4e in particular for the tasks mentioned in points a and b of this Article, except appointment and dismissing of staff. h.The CEO will regulate the rights related to the correspondence (use of the EU-VRi templates) and signature rights of the staff. (1)Die Gesellschaft hat einen oder mehrere Geschäftsführer, die durch Gesellschafterbeschluss bestellt und abberufen werden. (2)Die Geschäftsführer sind an die gesetzlichen Vorschriften, den Gesellschaftsvertrag, die Beschlüsse der Gesellschafterversammlung und deren Weisungen sowie an die Bestimmungen eines etwaigen Dienstvertrages gebunden. (3)Sind mehrere Geschäftsführer vorhanden, so haben sie sich gegenseitig über alle Geschäftsvorfälle, die für die anderen Geschäftsführer von Bedeutung sein können, zu unterrichten sowie vor Durchführung aller wichtigeren Maßnahmen miteinander zu beraten. (4)Widerspricht ein Geschäftsführer der Maßnahme eines anderen Geschäftsführers, so hat diese zunächst zu unterbleiben. Auf Antrag eines Geschäftsführers entscheidet, wenn mehr als zwei Geschäftsführer vorhanden sind, ein nach Köpfen zu berechnender Mehrheitsbeschluss sämtlicher Geschäftsführer. Sind nur zwei Geschäftsführer vorhanden oder kommt ein Mehrheitsbeschluss unter den Geschäftsführern nicht zustande, so entscheidet auf Antrag eines Geschäftsführers ein Gesellschafterbeschluss endgültig über die Durchführung der Maßnahme. Entsprechendes gilt bei sonstigen Meinungsverschiedenheiten unter den Geschäftsführern. (5)Die Geschäftsführer können im gegenseitigen Einvernehmen eine Geschäftsordnung aufstellen und die Tätigkeitsgebiete unter sich aufteilen, ohne dass hierdurch ihre Verantwortung für den gesamten Geschäftsbetrieb beeinflusst wird. Durch Gesellschafterbeschluss kann jederzeit eine Geschäftsordnung erlassen und auch eine durch die Geschäftsführer aufgestellte Geschäftsordnung geändert werden. (6)Alle über den gewöhnlichen Geschäftsbetrieb des Unternehmens hinausgehenden Maßnahmen darf ein Geschäftsführer nur aufgrund eines Gesellschafterbeschlusses vornehmen. Durch Gesellschafterbeschluss können die zustimmungspflichtigen Maßnahmen näher bestimmt werden. (1) StC assigns the management of the STZ to the STZ-Director. The STZ-Director shall manage the STZ on his own responsibility in accordance with the following provisions. The STZ-Director shall carry out this assignment contractually specified in the following free of (non-specified) instructions. He shall also independently determine the scope of his assignment. The STZ-Director shall not be bound to specific working hours. All necessary fiscal registrations shall be effected by the STZ-Director himself and he shall fulfil all applicable duties on his own responsibility. The STZ-Director shall, as far as required, obtain an additional occupation approval prior to commencing his assignment. Manages / coordinates work of: ADM.
(1)Ist nur ein Geschäftsführer bestellt, so vertritt dieser die Gesellschaft alleine. Sind mehrere Geschäftsführer bestellt, so vertritt jeder Geschäftsführer die Gesellschaft in Gemeinschaft mit einem anderen Geschäftsführer oder einem Prokuristen. (2)Durch Gesellschafterbeschluss kann einzelnen oder allen Geschäftsführern Einzelvertretungsbefugnis sowie Befreiung von den Beschränkungen des § 181 BGB erteilt werden. Any employee having any kind of contract with any of the OUs of R-Tech/EU-VRi. To employees with a working record less than one year will be referred to as EMP. Commission (DG RTD, DG INFSO, DG ENTR, and DG TREN). The LEAR provides the RDGs upon their request with up-to-date legal and financial data (including supporting documents) concerning the legal entity she/he represents. The LEAR enters the data through URF/PDM and the EC Central Validation Team (CVT) performs the validation after the data has been completed. The LEAR engages his organisation to maintain and update regularly the legal and financial data held by the RDGs regarding his legal entity, thus enabling its use for contracting and other transactions between his legal entity and the RDGs. The LEAR should regularly check the correctness of the available data in particular when he is aware of changes and of negotiations and other transactions ongoing. The LEAR distributes the Participant Identification Code (PIC) to other employees in his legal entity who might need it in the context of dealings with the RDGs, for example for electronic submission of proposals or negotiation of grant agreements. Performing of the respective tasks and duties in the projects to which they are assigned. Leading simple activities and taking over the responsibilities as specified in the DoW. A project manager is the person responsible for accomplishing the stated project objectives. Key project management responsibilities include creating clear and attainable project objectives, building the project requirements, and managing the constraints of the project management triangle, which are cost, time, scope, and quality. Coordinates all QMS activities including the contacts to auditors. CEO appoints the deputy QMG. pay the consideration for the activities rendered to it by the relevant subcontractor, clearly stating in the agreement entered into with such subcontractor that the latter shall be paid exclusively by the party without any further right on the community financial contribution which shall be granted solely to the parties of this agreement. clearly provide in the agreements with such subcontractors that the consideration agreed upon for the activities rendered by such subcontractor will fully cover the transfer to the relevant party of the property of any results of their activities (in terms of IPR, to obtain patterns, copyrights…), being furthermore agreed that such subcontractors shall not have any right on the foreground and/or on the background. The Executive Board is the supervision body for the execution of the project which shall report to and be accountable to the General Assembly (GenA). The Executive Board is responsible for the smooth execution of the project. The European Commission (formally the Commission of the European Communities) is the executive branch of the European Union. The term "Commission" can mean either the 27 Commissioners themselves (known as the College of Commissioners), or the larger institution that also includes the administrative body of about 25,000 European civil servants who are split into departments called Directorates-General and Services. The internal working languages are English, French and German. The Commissioners and their immediate teams are based in the Berlaymont building of Brussels. The body is responsible for proposing legislation, implementing decisions, upholding the Union's treaties and the general day-to-day running of the Union. The Commission operates in the method of cabinet government, with 27 Commissioners. There is one Commissioner per member state, though Commissioners are bound to represent the interests of the EU as a whole rather than their home state. One of the 27 is the Commission President appointed by the European Council. The Council then appoints the other 26 Commissioners in agreement with the nominated President, and then the 27 Commissioners as a single body are subject to a vote of approval by the European Parliament. The purpose of a Consortium Agreement is to specify with respect to the project the relationship among the parties, in particular concerning the organisation of the work between the parties, the management of the project and the rights and obligations of the parties concerning inter alia liability, access rights and dispute resolution. The Dissemination Manager is responsible for all dissemination activities in EU projects. The DMG, in accordance with the Project Coordinator (PCO), is responsible for review and approval of requests for dissemination activities submitted by partners of the project. Responsible to: PCO and EB. The Description of Work is usually part/Annex of the Grant Agreement (GA) the baseline of each project (its main reference point) where the project's structure and the work to be done is described. Usually the DoW will be updated during the project work. The Grant Agreement (GA) regulates the relation between the European Commission (EC) and the Consortium of a project. It is drafted by the European Commission and defines rights and obligations of the Consortium towards the EC. General Assembly is defined for different entities as indicated in the table below. The General Assembly is the ultimate decsion-making body of a project Consortium. Decision-making by voting of members. Regular meetings, at least once a year. The General Assembly is composed of all the Members. The General Assembly is validly constituted if the quorum 50% plus one of the Members is reached. Each Member is represented either by its legal representative or by “proxy”. The “proxy” shall hold a written power signed by the legal representative and be able to prove her/his identity to the “President”. The General Assembly surveys all the matter connected to the Grouping's activities and suggests the way to achieve the objectives of the Grouping. The suggestions of the General Assembly are not binding. The International Advisory Board will consist of specialists and practitioners from industry and research community to comment and disseminate project progress/results. The IAB feedback will be obtained through brainstorming sessions and surveys through focus interview and/or questionnaires. The IAB will meet with the PCO at least once a year throughout the project duration. Provide knowledge, existing data and experience on risk approach with emphasis on impact on quality at interface. Provide guidance in the definition of proposed programs to ensure future applicability and maximum benefit to the industry. Peer review progress and technical reports and provide technical advice/direction as required. Attend technical and project reviews to provide comment and technical direction. The coordinator is a beneficiary in his own right, but with additional duties. In short the coordinator is the contact point between the consortium and the Commission. The coordinator received payments from the Commission and distributes them to the beneficiaries. The coordinator submits the periodic reports and requests for amendments. with the exceptions foreseen in this grant agreement. discharges the Commission from its obligation on payments. e) monitor the compliance by beneficiaries with their obligations under this grant agreement. submitting the implementation plan of the of the Sub Project to the Executive Board for review and proposing an update of the Consortium Plan. advising the Coordinator of any discrepancy with the Consortium Plan, including any delay in delivery. Task Leader of each project task is appointed by the company in charge of the respective task in the project. The TSL is responsible for the quality of the work and results of a specific task. His duty is also to regularly report as defined for the given project. A Task Member is working (together with others) on a specific task in a project. A Task Member is responsible for the work and work results he/she has committed him/herself to deliver. Workpackage leader of each Workpackage is appointed by the company in charge of the respective Work Package in the project. The WPL is responsible for the quality of the work and results of a specific workpackage. His duty is also to regularly report as defined for the given project. A European Economic Interest Grouping (EEIG) is a type of legal entity created on 1985-07-25 under European Community (EC) Council Regulation 2137/85. An EEIG must have at least two members from different Member States. The purpose of a European Economic Interest Grouping is to facilitate or develop the economic activities of its members by a pooling of resources, activities or skills. Figures in procedures are always numbered sequentially starting from 1 (e.g. "Figure 1"). When referenced in other procedures the figure number shall include the procedure/QMS-document code (e.g. "Figure 1 - PROC-SW"). The OU of R-Tech/EU-VRi in the sense of QM area. 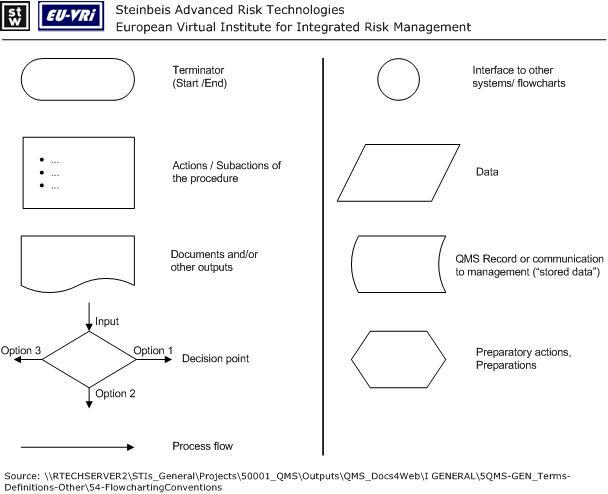 R-Tech/EU-VRi is the short for describing the combination of "Steinbeis Advanced Risk Technologies Group" and "European Virtual Institute for Integrated Risk Management". The Steinbeis Enterprises (SEs) are the elements/backbone of Steinbeis transfer network. Depending on the specialist discipline and the focus of work, these SEs employ experts in either legally dependent Steinbeis Transfer Centers, Steinbeis Research and Innovation Centers, Steinbeis Consulting Centers, Steinbeis Transfer Institutes or companies of an independent legal nature. The Network also includes Enterprises operating under franchising arrangements or minority shareholdings. In 2012, 918 Enterprises joined the Steinbeis Network. The Steinbeis-Stiftung für Wirtschaftsförderung (StW – “Steinbeis Foundation for Economic Development“) acts as an umbrella organization of the Steinbeis network. The non-profit foundation and its subsidiary the Steinbeis GmbH & Co. KG für Technologietransfer (StC), responsible for all commercial activities related to knowledge and technology transfer. The two institutions underpin the entire organization and are both headquartered in Stuttgart, South-West Germany. Centers based at Steinbeis Forschungs- und Entwicklungszentren GmbH (Steinbeis Research and Development Centers) are specialized in market and transfer-orientated contractual and developmental research, as well as research on behalf of the network. Centers falling under Steinbeis Beratungszentren GmbH (Steinbeis Consulting Centers) act as professional advisors in the field of management consulting, expert evaluations and training. The Steinbeis University Berlin encompasses a variety of Transfer Institutes offering tangible knowledge and technology transfer via training and degree programs. Steinbeis Beteiligungs-Holding GmbH oversees Steinbeis majority holdings and several company equity holdings. The STW Verwaltung has two main organizational parts which play for R-Tech a big role. The two parts are Personnel Management and Financial Management. Personnel management is responsible for the preparation of contracts and the transfers of wages. Financial Management is responsible for the postings of our Accounts department with associated information (Bankbuch, Kassenbuch, RA- Protokoll). For further information about the STW Verwaltung/Zentrale, R-Tech can use the STW Infodienst. software for the planning, bookkeeping, financial project management and personal management. See How to access the WALTER.